Bob and Leslie Bell ought to be the most famous folks from the small, coastal hamlet of Homer, Alaska — also known as the “Halibut Fishing Capital of the World” and “the end of the road” as the last stop on Alaska’s Sterling Highway. Instead, that recognition probably goes to their neighbors, the Hillstrand family from The Discovery Channel reality TV show “Deadliest Catch” or to singer Jewel Kilcher (“Who Will Save Your Soul,” “You Were Meant for Me”), who rose to instant stardom in 1995 with her album “Pieces of You,” still one of the best-selling debut albums of all time, having gone 12-times platinum. 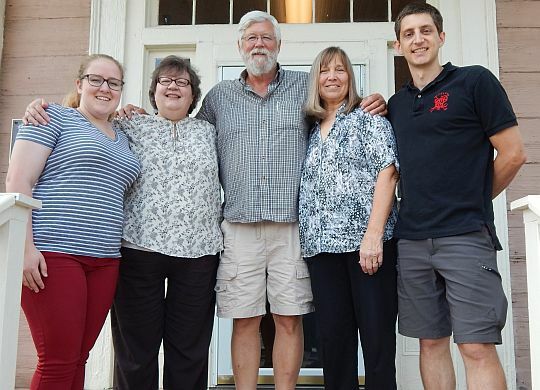 The Bells, though, have been volunteering in the affordable housing ministry for more than 20 years and have visited 75 countries and led 48 international volunteer build trips. These two former teachers, though, are more interested in service than stardom and in faith-building more than fame-building. “We don’t even have TV, for one,” added Leslie, who taught Jewel in middle school. Among the important things the Bells have to do is to plan next month’s first-ever Fuller Center Global Builders trip to Papua New Guinea, one of this affordable housing ministry’s newest and most exotic international covenant partners. Fortunately, the Bells not only have loads of experience leading international volunteer trips with Habitat for Humanity and The Fuller Center, but also the 75 countries they have visited includes previous visits to Papua New Guinea. In fact, years ago they trained Petrus Martin, who now serves as the coordinator for The Fuller Center’s operations in Papua New Guinea. 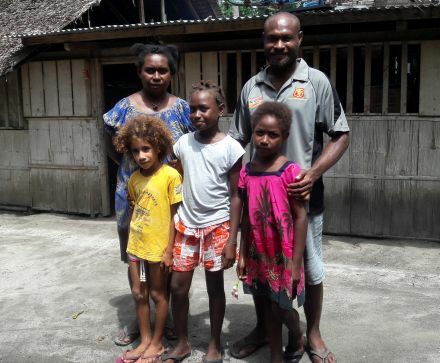 The Fuller Center Global Builders team led by Bob and Leslie Bell will be partnering next month with the Korong family from the Panapai Village of Kavieng District, New Ireland Province, to build a safe, new home. The Bells will be leading a team of at least 16 volunteers on next month’s trip to build a home in partnership with the Korong family in the Panapai Village off Kavieng District in New Ireland Province. Sam, a woodworker and furniture maker, and Harriet, who sells produce and baked goods, have longed for a decent home in which to raise their daughters since their former house made of untreated logs and bamboo recently had to be torn down. Bob and Leslie both said that based upon their previous trips to Papua New Guinea and the motivation provided by Martin they know the Korong family and others in the community will be heavily involved in working alongside Fuller Center volunteers. Venturing to far-away places like Papua New Guinea may seem inconceivable to people used to the modern conveniences of bustling American cities with a Starbucks seemingly on every corner, but 50 years of Alaskan living on the shores of Kachemak Bay have the Bells prepared to handle all the ups and downs that come with international volunteering in impoverished villages. One thing they have figured out, time and time again, is that these trips are part of a spiritual journey — their own and the volunteers who join them on these missions, something Leslie said she and Bob learned directly from Millard Fuller, who met the Bells while speaking to churches in Alaska and then encouraged them to come to Americus for a volunteer stint, where their love of international service was nurtured and flourished. Leslie said that the volunteers on this trip are not just fulfilling needs in a community but are nourishing their own spiritual needs, adding that morning devotions before each work day are a crucial component of their trips. They also believe that by planning and organizing such trips that they are merely opening doors for other service-minded people to walk through.